Let me tell you, it feels good to finally have a visual novel to be really positive about in a review. After a year of reasonably average reading Symphonic Rain has started my 2015 with a bang, and I’m more than happy to recommend it (wow, that shows how long ago I wrote this). 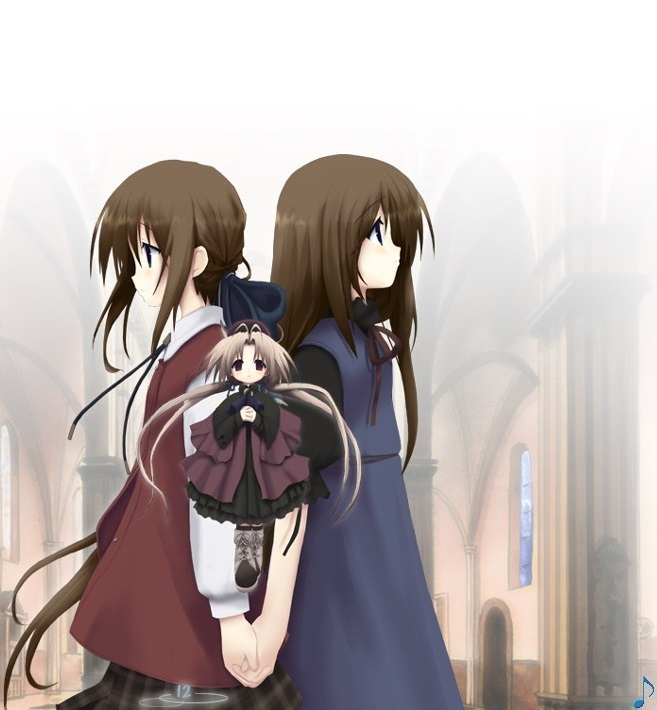 With a unique concept, gripping emotion and one of the most comfortable atmospheres known to the medium, this is another experience that deserves its elevated position in the Visual Novel Database rankings. And it features a decent rhythm game, to boot. A friend of mine hit the nail on the head when he suggested that one of Symphonic Rain’s charms is just how comfortable it makes you feel. For much of the common and character routes it’s easy to sit back and be swept along by the predominantly mundane events occurring before your eyes. A mix of the visuals (more on those later), character personalities and the overall plot forms a wholly calming experience…at the same time, though, you may get the nagging feeling that something’s not quite right. Still, sitting relaxed in my chair, it was hard to predict the emotional gut-punch the story had in store for me. Comfortable though it may be, Symphonic Rain is not a happy tale, with feeling packaged throughout that will permeate your entire self, like an underlying layer of emotional turbulence. Admittedly, the climax periods of each route are relatively brief when compared to the rest of the plot, but they’re the kind of revelations, plot twists and empathy landmines that stick with you long after the story itself is complete. Regardless, it’s that brevity that prevents me from awarding a higher score in this review, as the less intense portions struggle to sustain themselves later in the story. One route in particular rehashes a lot of what you’ve already seen, as well, without adding enough new content to be truly enjoyable. 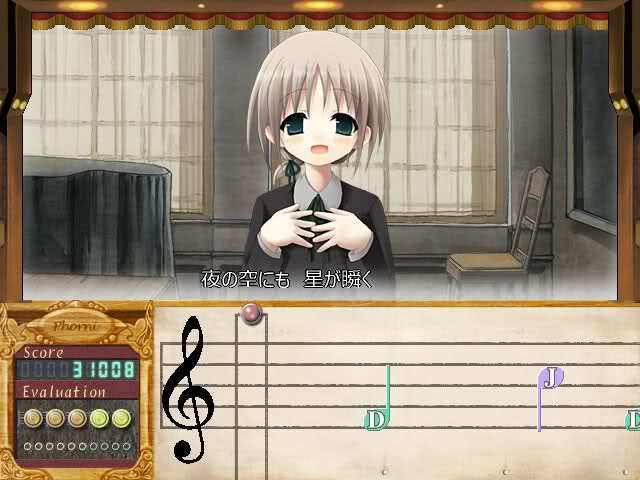 As mentioned earlier, the visual novel features a basic rhythm game using the keyboard like a piano. Unfortunately, it uses low quality sound files when compared with the rest of the BGM which can impact negatively on the experience, especially when you’re asked to play the pieces without vocal accompaniment. Technical calibre aside, the songs are put to fantastic use. Each character has their own piece which they themselves sing and every time I played alongside them I could feel more of a connection to them developing. The sound of each song and also their lyrics are perfectly fitting for the route they are used in, adding to the bond between character, story and music in a fantastic way. Mid-way through the first route I was having great fun bashing away at- er, playing Chris’ fortelle. By the end of the game (and even six months afterwards), playing those songs brought back the emotional hits from the routes they belonged to in full force, so you can tell they do their job right. Going back to that atmosphere I discussed after the synopsis, it’s the characters themselves that have a lot to do with its formation. They’re all interesting, consistent and have their own unique story to tell, so it’s easy to bond with them. It’s worth moving into the technical side of things here because the character sprites also contribute to the overall feel of Symphonic Rain in a positive way. While they may not be Full-HD 3D Surround Sound Virtual Reality Capable™, everything from their expressions to their poses are just so well suited to their roles in the visual novel. They took me a while to get used to though, as the art style used is somewhat unique and, to begin with, the heroines do look kind of same-y. 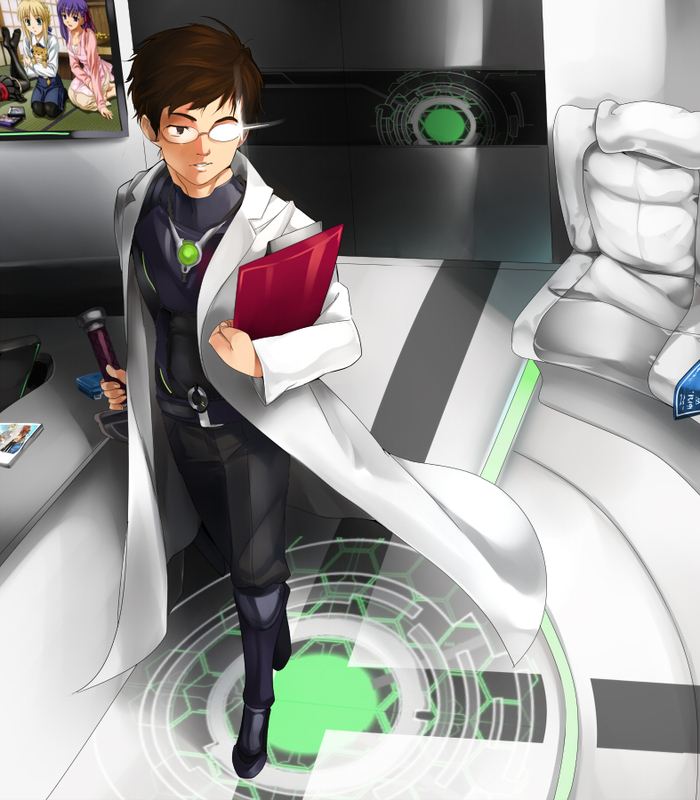 There’s also one side character in particular with a sub-par sprite, and the CGs are average at best. The backgrounds used do a good job of suiting the mood and feel of the setting without being spectacular in and of themselves. The BGM, consisting of vocal-less versions of the songs you play, are pretty nice but make me wish there had been a tad more variety, and the voicework is as good as usual. Summary – Symphonic Rain was a fantastic read due to both the comfort induced by its common route and the emotion invoked by its climaxes. The characters, art and story mesh in a way that allows for quick and deep emotional bonding, which gives those emotional highs and lows that much more impact. The use of a rhythm game, which in itself is not fantastic, nevertheless manages to complement the visual novel’s other components near-flawlessly with original vocal tracks that carry the emotion of the story with them. While the brevity of its best segments pulls it down, it is held back more by what it aims to be than by any flaws or faults in its production. In any case, Symphonic Rain can be considered Highly Recommended. 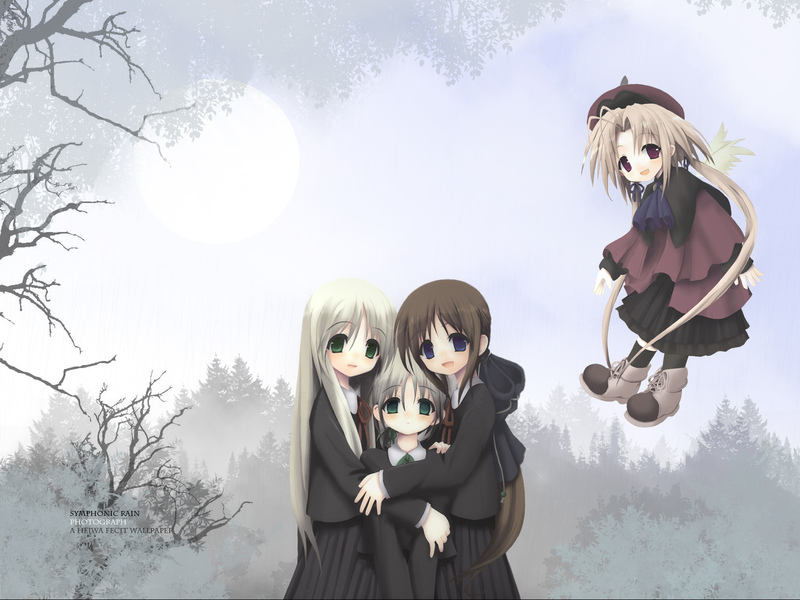 This entry was posted in Reviews, Visual Novel Reviews and tagged kuroneko, kuroneko-san, Review, symphonic rain, team, Visual Novel, VN. Bookmark the permalink. “overall plot forms a wholly calming experience…at the same time, though, you may get the nagging feeling that something’s not quite right.” I’ve really wanted to write something with that atmosphere. 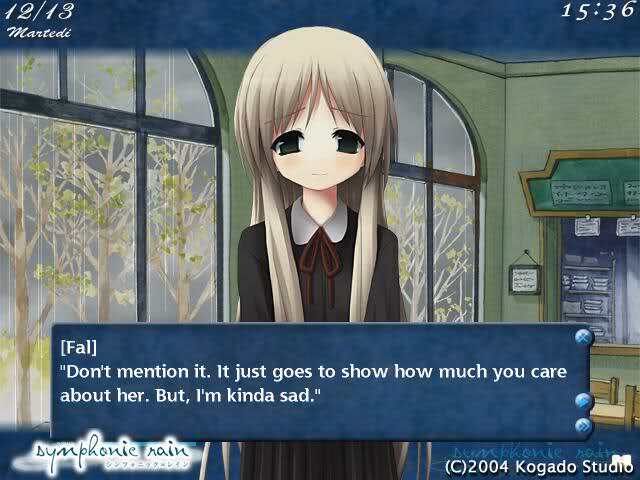 This visual sounds nice in Katawa Shoujo kind of way. Also, tell me if you want me to pull down your list from my last post as I wasn’t sure if you wanted it take down or not. Symphonic Rain nails it pretty well, though i’m not sure i’d recommend it to you simply because of the romance component. It just doesn’t seem like your type of story to me. I’d be interested to see you write up a concept that doesn’t include some sort of adventure. Nah, no worries there. You’re only using it to prove a point rather than a comprehensive list of top-tens. So, does anyone know what happens in Phorni’s route? I believe she’s still alive at the end of her route? From what you described of it’s atmosphere, looks very interesting. It’s another one of those VNs I downloaded during my early days when I just ventured into VNs, but for some reason, my files don’t work :p I never expected it to have a rhythm game in it though, so that will be interesting to try out too when I finally get to this VN. There’s a bit of technological wizardry needed to run it, though, so it’s best to take a look at the ReadMe. You have to run a special .bat file before playing or something. Be sure to let me know whether you like it!